Tim and myself got our boats ready to leave. Did the usual engine checks - must find where that oil in the bilge is coming from! Tim turned his boat around and the throttle keep returning automatically to neutral - stopped to get it fixed. Got as far as the lock and at this point my combined gear/throttle decided to become loose. As I keep going (no astern) I whipped off the control handle to find that the grub screw had made a nice groove around the spindle and had stopped gripping. Out with the tool kit and grab the molegrips. That should keep me in charge till I repair it tomorrow. I was going to stop and pick up some logs for the fire but with the delays we are now running a little late so its straight on to Bramwith. 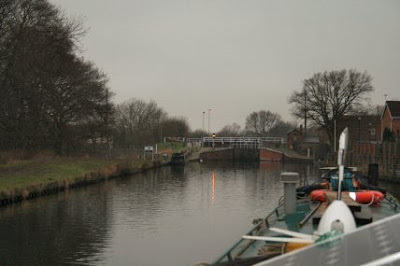 Due to the uncertainty of the controls we have stopped at the swing bridge till the lever is fixed. Chris and Harry are coming out. Harry is a good friend from way way back. Our claim to fame was the walking of the complete Hadrians Wall from coast to coast carrying all our gear with us. The journey took just four days to complete and was well worth the effort. If anything I would miss out the first 20 miles as the road is onto of the wall out of Newcastle. Then it goes off into the moors and the scenery and walking is a delight. Harry? Harry is the sort of bloke that always has a carrier bag or dustbin bag with him and litter picks all the way. He will never be at a lost for something to pick up with all the peasants that seem to be about these days.